DVD memories The nice thing about making a DVD record of the convention weekend is that I can come home and watch all the performing artists once again and this certainly does help to prolong those happy memories which a GFS convention weekend is always guaranteed to create. This weekend was no different, in some ways it was one of the better meetings. Andy Eastwood But what a weekend of entertainment, especially when Andy Eastwood arrived unexpectedly. All credit to Andy, you would think this much travelled, highly talented professional entertainer would have preferred a quiet weekend (he is so busy that he doesn't get many of those!) 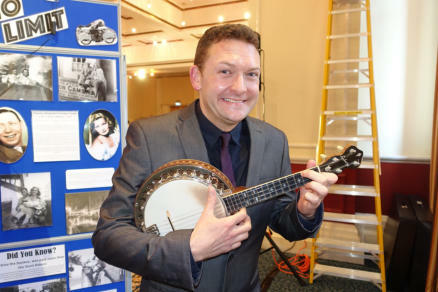 but Andy will always support The George Formby Society whenever he can and this weekend was no exception, he gave his usual brilliant performance on Sunday afternoon and was asked to do a third number by a very grateful audience. Andy is constantly booked all year, not only in the UK but also throughout the world and he is a credit to all that is best about the GFS. Changes A new sound system in a different location at the front and to one side of the Lancastrian Suite and manned by GFS President Gerry Mawdsley. Since the Society was formed 55 years ago they have never owned their own sound equipment but now we do, a brand new digital system and even though those who manned the mixing desk where all new to the equipment, there were very few issues to report and the sound was good throughout the two-day event, no complaints whatsoever. Also this weekend we had another "historical" moment in that the films in our cinema were projected for the first ever from a computer generated file sourced from a Apple iPad. So we have progressed over the years from film to video to DVD and now to a computer file. Again, the quality of the films was just as good, and they were projected in the correct 4:3 ration that cinema-going audiences in the 30s and 40s would have viewed. Top class performances Other than Andy Eastwood, some great performance from many of our members. Ray Reynolds, Johnny Key and Gladys Geoghegan travel from the London area for every convention and never disappoint with their performance. Johnny Key finds the most obscure Formby numbers to perform and always gives a good rendition of songs that most members will keep away from. James Bassett is always good and the Davies Sisters, Francesca and Catelina sounded as lovely as ever. Alternative entertainment If you fancied a change from Formby we even had a spot of jazz on Sunday morning when Alan Newton (Trombone) and Jon Baddeley (Clarinet) with the support of The GFS Band entertained with a couple of numbers. Brian Gibbs also deserves a mention, not only did he sing Formby, but he brought his guitar along and played some well known classics which everyone appreciated. The 55th year I could go on! But there is a set of DVDs to edit and get in to the GFS Shop so perhaps those who didn't get to Blackpool can still enjoy an unmissable weekend. This is the 55th year of the GFS and the forthcoming weekends on June11 & 12, September 17 & 18 and November 19 & 20 promise to be (as ever) just as good - I can't wait! New sound system heralds the changes! DVD memories The nice thing about making a DVD record of the convention weekend is that I can come home and watch all the performing artists once again and this certainly does help to prolong those happy memories which a GFS convention weekend is always guaranteed to create. This weekend was no different, in some ways it was one of the better meetings. Andy Eastwood But what a weekend of entertainment, especially when Andy Eastwood arrived unexpectedly. All credit to Andy, you would think this much travelled, highly talented professional entertainer would have preferred a quiet weekend (he is so busy that he doesn't get many of those!) 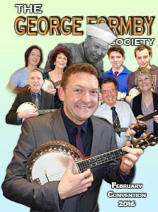 but Andy will always support The George Formby Society whenever he can and this weekend was no exception, he gave his usual brilliant performance on Sunday afternoon and was asked to do a third number by a very grateful audience. Andy is constantly booked all year, not only in the UK but also throughout the world and he is a credit to all that is best about the GFS. 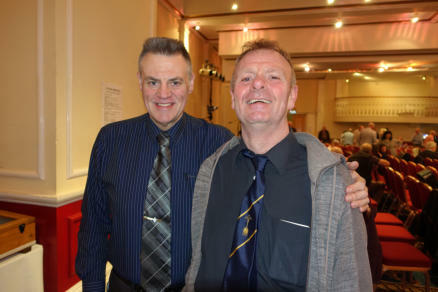 Changes A new sound system in a different location at the front and to one side of the Lancastrian Suite and manned by GFS President Gerry Mawdsley. Since the Society was formed 55 years ago they have never owned their own sound equipment but now we do, a brand new digital system and even though those who manned the mixing desk where all new to the equipment, there were very few issues to report and the sound was good throughout the two-day event, no complaints whatsoever. Also this weekend we had another "historical" moment in that the films in our cinema were projected for the first ever from a computer generated file sourced from a Apple iPad. So we have progressed over the years from film to video to DVD and now to a computer file. Again, the quality of the films was just as good, and they were projected in the correct 4:3 ration that cinema- going audiences in the 30s and 40s would have viewed. Top class performances Other than Andy Eastwood, some great performance from many of our members. 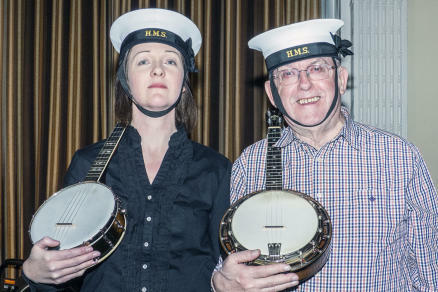 Ray Reynolds, Johnny Key and Gladys Geoghegan travel from the London area for every convention and never disappoint with their performance. Johnny Key finds the most obscure Formby numbers to perform and always gives a good rendition of songs that most members will keep away from. James Bassett is always good and the Davies Sisters, Francesca and Catelina sounded as lovely as ever. Alternative entertainment If you fancied a change from Formby we even had a spot of jazz on Sunday morning when Alan Newton (Trombone) and Jon Baddeley (Clarinet) with the support of The GFS Band entertained with a couple of numbers. 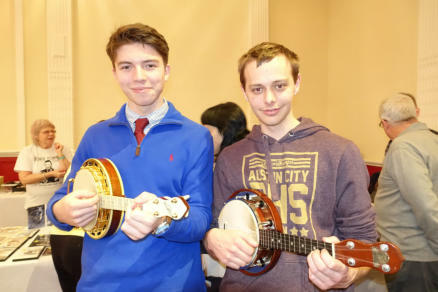 Brian Gibbs also deserves a mention, not only did he sing Formby, but he brought his guitar along and played some well known classics which everyone appreciated. The 55th year I could go on! But there is a set of DVDs to edit and get in to the GFS Shop so perhaps those who didn't get to Blackpool can still enjoy an unmissable weekend. This is the 55th year of the GFS and the forthcoming weekends on June11 & 12, September 17 & 18 and November 19 & 20 promise to be (as ever) just as good - I can't wait!